Wholehearted Vintage: The shop is back! I've had a busy couple of months - getting engaged (more on that at a later date), buying a house, moving into said house. 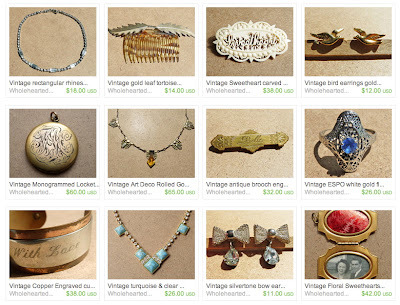 We've still got a lot of work to get done on the house, but I'm feeling settled enough to flip the switch back on the Wholehearted Vintage Etsy Shop. I'll continue to add listings over the next couple of days. Then I get the joy of unpacking all of the new pieces I bought before the move. I'm sure there's a bunch in there I've forgotten about - rediscovering them will be like Christmas! Don't forget - vintage jewelry makes a great Christmas gift - it's beautiful and eco-friendly!